CD2 came with a silver Pulp sticker. The remixes on tracks 1 and 2 are not available anywhere else. * Same as the 7" edit except the word 'screw' is muted. Black Session tracks recorded 30 October 1995 (France Inter, Paris). There is a war in progress - don't be a casual(ty). The time to decide whose side you're on is here. Choose wisely. Stay alive in '95. 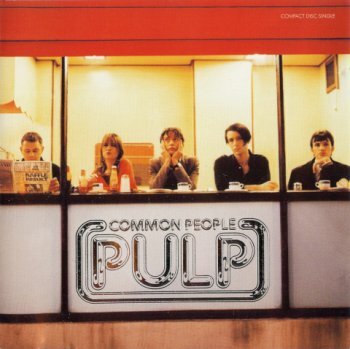 When 'Common People' was first aired at Reading last year it seemed to your correspondent the most potent political statement of cultural ambivalence since the Manic Street Preachers. But that's festival "fever" for you. Herein lies a simple truth: artistic rich people are forever wishing to be artistic skint people in the name of empathy with the belaguered because guilt is the price of privilege. 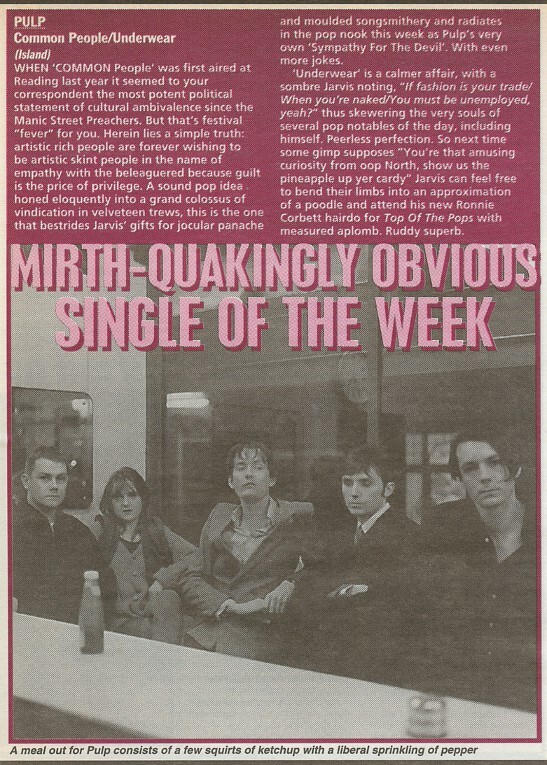 A sound pop idea honed eloquently into a grand colossus of vindication in velveteen trews, this is the one that bestrides Jarvis' gifts for jocular panache and moulded songsmithery and radiates in the pop nook this week as Pulp's very own 'Sympathy For The Devil'. With even more jokes. 'Underwear' is a calmer affair, with a sombre Jarvis noting, "If fashion is your trade / When you're naked / You must be unemployed, yeah?" thus skewering the very souls of several pop notables of the day, including himself. Peerless perfection. So next time some gimp supposes "You're that amusing curiosity from oop North, show us the pineapple up yer cardy" Jarvis can feel free to bend their limbs into an approximation of a poodle and attend his new Ronnie Corbett hairdo for Top Of The Pops with measured aplomb. Ruddy superb.